3.6 out of 5 based on 178 bloggers and 41 commenters. 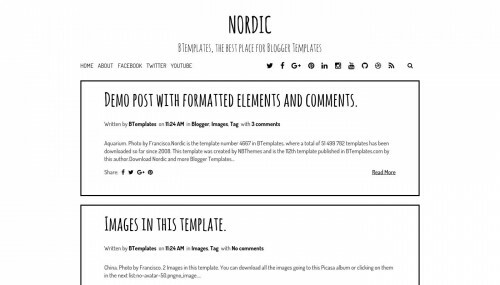 Nordic is a free blogger template adapted from WordPress with 1 column, responsive design, seo friendly, footer columns, social bookmarking icons, related posts support and simple look. Excellent template for blogs about art, crafts or to write a diary. WoW!!! It Is Really Nice Blog.I like This Blog. I think this template is really good. I would give it 3,5 out of 5 stars. But I think it could be better if the template shows the picture in the post without viewer have to click ‘read more’. Very clean and minimal styled Blogr template. Really liked the hand written fonts used as theme headings. when i download it, it won’t work… is there a coding you guys can just send me so i can use it? Wow that was an awesome theme. Thank you for sharing. Can i insert Dynamic Slideder? how can I change setting for social media account on socmed icon? This templates is very nice and useful. Thanks for sharing. Congratulations on having 1 of the most sophisticated blogs I’ve come throughout in some time! hey..just wanna give some review to this template..i think this template is so great for personal blog..but there some minus..like thumbnail at homepage..or bug at footer, bug at comment..so i redesign this template..if any of you wanna this template with thumbnail and some fixes..just view demo at ginanjarwidodo.blogspot.com..
Template is so good ..
Template is very nice. And good blog. o vigore da sentençia musicas sentimentas. Please help me ….. Could you please tell me how I can reduce title font size??? Simple and beautiful template. It’s available use in wordpress and blogspot right? where is thumbnail post at home blog. i need thumbnail for making interest. Thanks for Beautiful and Simple Templates.